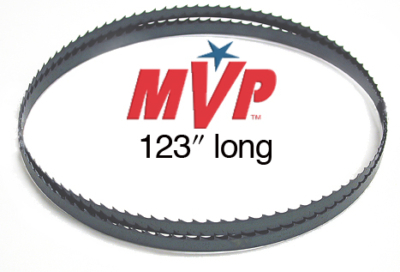 Cobalt / Molybdenum High Speed Steel Edge, Tempered Back MVP Band Saw Blades are .025 Thin Kerf bands made with high speed teeth and a special alloy back to provide superior performance and longevity. Features: Tooth Hardness: 66-68 Rc Back Hardness: 47-51 Rc Tooth Form: Hook Raker Set: Left, Right, Straight Pattern Widths: 1/4″, 3/8″, 1/2″ For contour cutting and resawing: exotic wood, hard/soft wood, plastic, steel and non-ferrous metals (with speed reduction). Designed to outlast standard carbon blades 5:1 (wood) and 10:1 (metal). Tough and shock resistant, provides truer, straighter cuts in even the most difficult cutting operations. Cuts through nail embedded wood! For all vertical/stationary band saws, taking band lengths of 71-3/4″ through 142″. 71-3/4in. to 72in. long and .025in. thick with Hook style teeth. These blades fit 10in. Delta 28-140 and 11in. Shopsmith band saws. 72-1/2in. long and .025in. thick with Hook style teeth. These blades fit 10in. Delta 28-195 & BS150LS, 10in. Skil HD3640, and 10in. Dremel 1120. 80in. long and .025in with Hook style teeth. thick. Fits all Sears Craftsman 12in. Tilting Table or Tilting Head Band Saws except Models 22412 (91in. blade) & 22400 (89-1/2in. blade). 82in. long and .025in. thick with Hook style teeth. Fits 12in. Delta 28-190 and 12in. Jet. 89-1/2in. long and .025in. thick with Hook style teeth. Fits 12in. Craftsman 22400. 93-1/2in. long and .025in. thick with Hook style teeth. Fits most 14in. Delta /Rockwell, Jet, Rikon, Sears Craftsman, Steel City 50100, Reliant, Enlon, Star, Bridgewood, Woodtek, General, etc. Check your owners manual for correct length. 99-3/4in. long and .025in. thick with Hook style teeth. Fits 14in. Craftsman 22401. 105in. long and .025in. thick with Hook style teeth. Fits most 14in. band saws (Delta/ Rockwell, Jet, Rikon, Sears Craftsman, Reliant, Enlon, Star, Bridgewood, Woodtek, General, etc.) with Riser Block Extension. 111in. long and .025in. thick with Hook style teeth. Fits 10-325 Rikon 14in. deluxe band saw. 123in. long and .025in. thick with Hook style teeth. Fits 16in. Jet band saw. 125in. long and .025in. thick with Hook style teeth. Fits 50200 Steel City 16in. and Laguna LT14 SUV band saws. 133in. long and .025in. thick with Hook style teeth. Fits original Jet 18in. band saws. 136-1/2in. long and .025in. thick with Hook style teeth. Fits 18in. Delta, new version Jet (18X), and Steel City 50250 band saws. 142in. long and .025in. thick with Hook style teeth. Fits 10-345 Rikon 18in. band saws.